A Blade of Grass is pleased to announce Prerana Reddy as our new Director of Programs. 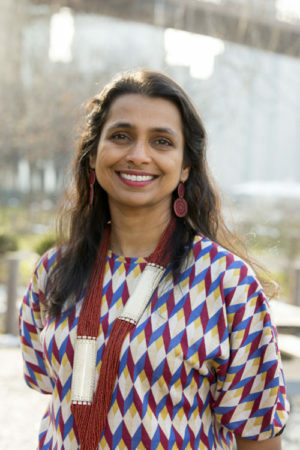 Prerana joins ABOG from the Queens Museum of Art where she served as Director of Public Events, organizing screenings, performances, discussions, and community-based collaborative programs and exhibits. At the Queens Museum she also developed an intensive arts and social justice program for immigrant youth and a community development initiative for Corona, Queens residents. Prerana is a Douglass Redd Fellow, awarded by the Ford Foundation to leaders in the fields of culture and community development. She is also a documentary filmmaker and researcher whose work has explored such topics as alternatives to juvenile detention, the history of slavery in New York City, and the 2004 World Social Forum in Mumbai. On Prerana’s appointment, ABOG Executive Director Deborah Fisher commented: “A Blade of Grass nurtures socially engaged art by both directly supporting artists who are making social change in communities, and creating engaging, thought-provoking content about their projects. Prerana brings a truly unique skill set to this position and we feel she will be a perfect fit. Prerana will oversee ABOG’s Fellowship program, documentary film and web content production, extensive public programming schedule, and other initiatives that expand understanding of socially engaged art. Read Prerana’s full bio here.